We create beautiful apps for iPhone, iPad, Mac, and Apple TV. With more than 12 years experience with the Apple platform, we have a proven track record of delivering quality, stable, and easy-to-use software for businesses and consumers. We can quickly move from concept through to prototype and deployment, and provide a better user experience for you and your customers. With more than 3,000 stores located across Europe, DM is a leading retailer of cosmetics, healthcare, health food, and household products. Developed by Factorial, the DM iPhone App launched to more than 80,000 users on day one, and has now been rolled out across six countries. 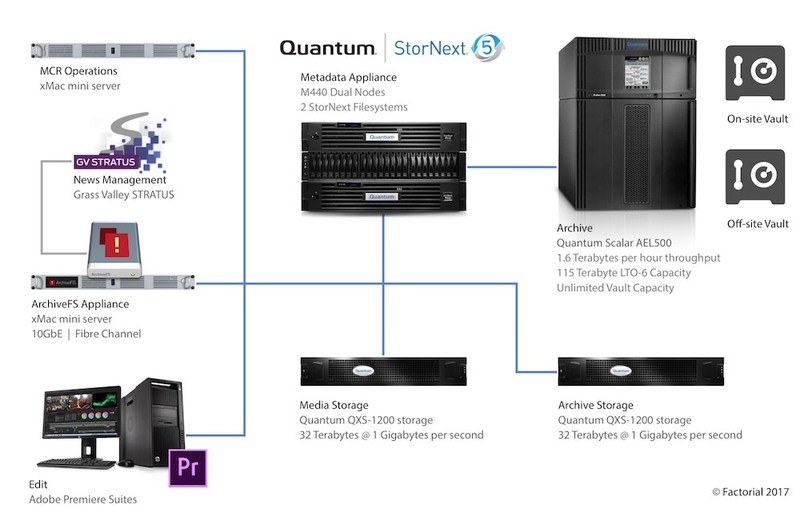 ArchiveFS presents a StorNext Archive as a user-friendly and application-friendly file system hosted on a Mac. Safely browse archive volumes without triggering unwanted restores from LTO tape or Object storage. Intelligently manage bandwidth, checksumming, versioning, and permissions. ArchiveFS is deployed with two New Zealand broadcasters and manages more than half a million assets. Developed by Factorial for Wingnut Films, Wingnut TV brings film review to the iPad in a powerful and elegant interface. Specifically designed for the requirements of film directors, Wingnut TV uses Factorial’s ClipTouch Server lightweight asset management platform to curate and manage the content presented inside the app, delivered with enterprise-class security. Leverage our experience designing broadcast and post-production workflows — from small creative workgroups all the way to the largest post-production pipelines on the planet. We start by understanding how you work, and identify opportunities to simplify complex tasks, and improve productivity. We can solve even the most complex integration challenges using our toolbox of technology building blocks. Park Road Post Production is an internationally renowned purpose-built facility, providing award-winning sound and picture finishing alongside industry-leading development of digital workflows. Completed in 2002 in time to deliver the final mix on Peter Jackson’s The Lord of the Rings: Return of the King, Park Road has continued to provide post production at the highest level to filmmakers all over the world. Factorial is proud to have developed cutting-edge workflow tools to power Park Road Post Production’s pipeline used on The Hobbit trilogy and several other feature films. Māori Television is New Zealand’s indigenous broadcaster, providing a wide range of local and international programmes for audiences across the country and online. Māori Television is tasked with contributing to the revitalisation of the Māori language, and to be an independent Māori television service that is relevant, effective and widely accessible. Factorial has delivered Māori Television’s shared storage and archive platform, providing near-line transmission storage and archive for two television channels, as well as collaborative editing and production, and video on demand via the web. The New Zealand Racing Board promotes, supports, and broadcasts the most entertaining sport and racing events for New Zealand. Factorial has delivered the New Zealand Racing Board’s shared storage platform, supporting post-production and archive for the two TAB Trackside television channels. Ngā Taonga Sound & Vision is New Zealand’s moving image and sound archive, dedicated to collecting and protecting Aotearoa’s audiovisual heritage, and sharing it with the widest possible audience. Factorial has been selected by tender to provide a multi-site shared storage and archive system to support all of Ngā Taonga Sound & Vision’s digital preservation requirements, and to make digital assets available on-demand both internally and online via the web and mobile applications. The Malaghan Institute is New Zealand’s leading independent biomedical research institute with more than 90 researchers and support staff working on cancer, allergy, arthritis, multiple sclerosis and infectious diseases. Factorial has architected and supports The Malaghan Institute’s core IT infrastructure — servers, shared storage, backup and archive. Factorial also provides custom integration software for client management and backup, as well as web services and database integration. We select only the best technology partners to deliver reliable high performance systems to match your business requirements. Thomas graduated in physics and worked as a scientist before he decided to switch entirely to IT. Thomas has over fifteen years of experience as a developer on the Apple platform. He manages product and software development at Factorial and is responsible for Wingnut TV, ClipTouch Server, as well as for several Film and TV integration projects here in New Zealand, and internationally. Tim graduated in Chemical and Process Engineering before switching to a career in IT. Tim has more than fifteen years experience in the IT industry. Tim has a passion for designing and optimising rich media pipelines and their associated infrastructure. He has architected and delivered large and complex projects in the broadcast, and feature-film post-production sectors. Andrew has been immersed in the world of computers and development from an early age. Andrew has more than ten years of experience in the IT industry, and brings a large base of multi-platform knowledge and expertise. He manages all scripting and web technologies, and contributes as a co-developer to Factorial's native iOS and macOS app development. © 2019 Factorial Ltd. All rights reserved. Factorial is a registered trade mark of Factorial Ltd. in New Zealand. Apple and the Apple logo are trade marks of Apple Inc., registered in the U.S. and other countries. 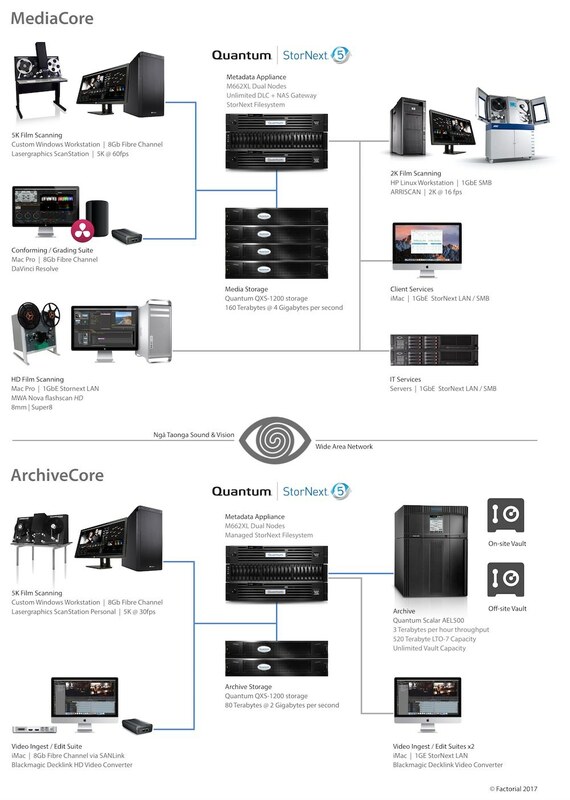 ArchiveFS is deployed with two New Zealand broadcasters and manages more than 500,000 assets. Factorial recently designed and developed the new DM iPhone App which has launched in April 2015 to more than 80,000 users on day one. Development was carried out in cooperation with Synetworks who was responsible for project management and the design of various back-end and content management systems maintained by Cards&Systems. Integrating the App with various real-time back-end systems in an efficient way was a real challenge, and Factorial’s rapid prototyping approach and flexibility made this very easy. Throughout the whole development process Factorial proactively updated the App’s visual and functional design several times to match iOS design evolution and delivered a beautiful, native, high-quality iOS user experience for DM’s customers. Factorial has worked with the Malaghan Institute for more than five years, and deployed a new StorNext Pro Foundation clustered storage solution in 2015 — consolidating all SAN, NAS, VM, compute, and backup storage onto a single high-availability and scalable platform. 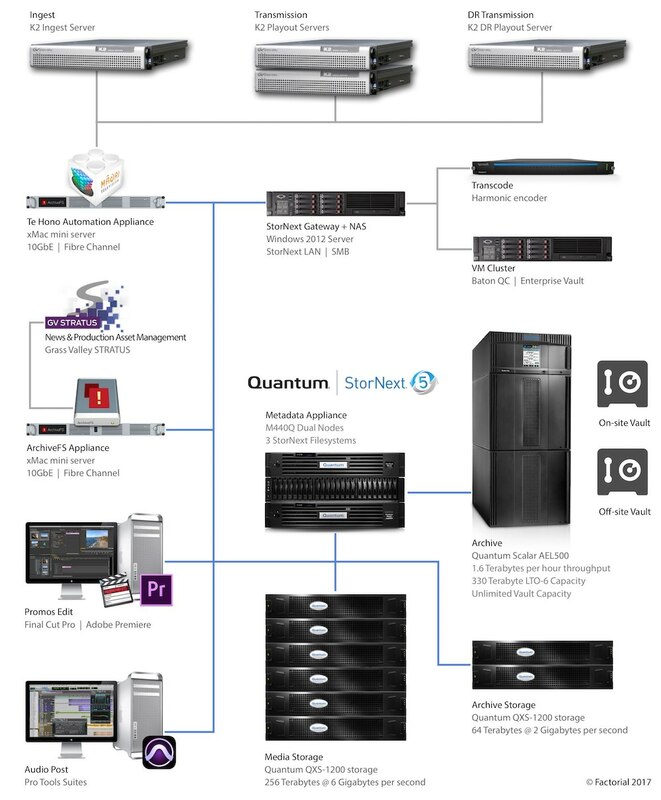 Factorial designed and commissioned a system based on StorNext comprising more than 400 Terabytes of disk storage, 330 Terabytes of near-line LTO storage, and unlimited off-site archive storage hosting all of Māori Television’s digital media assets. Factorial has integrated multiple asset management platforms and workflows on the same shared storage platform using a custom integration app developed for Māori Television called Te Hono, and a Factorial ArchiveFS Appliance. 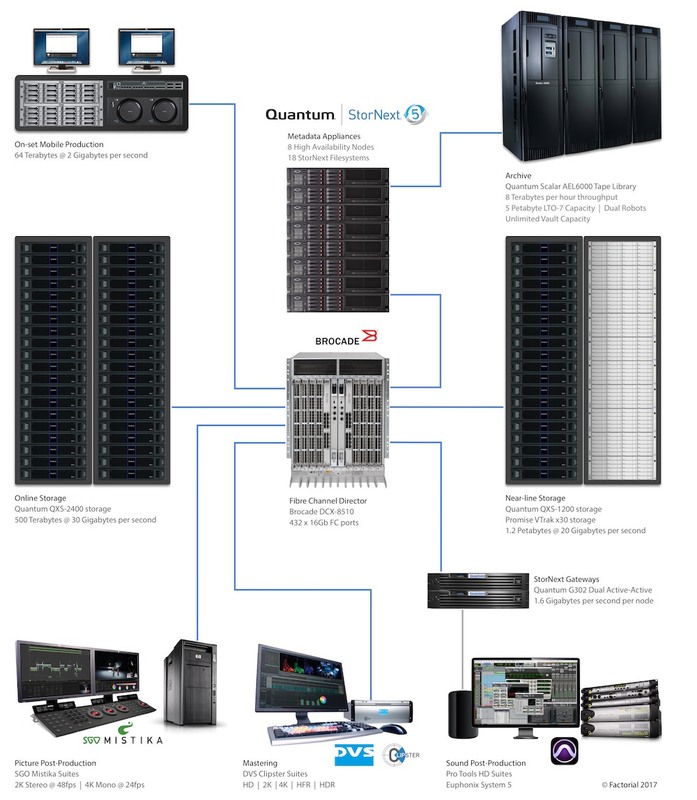 Factorial has designed and commissioning a system based on StorNext comprising more than 280 Terabytes of disk storage, 500 Terabytes of near-line LTO storage, and unlimited off-site archive storage hosting all of Ngā Taonga Sound & Vision's digital media assets. Factorial is also contributing to the development of new workflows for accession, post-production, and delivery of archived assets. Factorial supports near-line and off-site archive storage for all of TAB Trackside’s digital video and radio assets. Factorial has integrated the New Zealand Racing Board’s StorNext Archive directly with Grass Valley STRATUS News and Production Management with an ArchiveFS appliance managing more than 250TB of digital assets. A multi-year partnership with Park Road has been founded on making technology choices that empower the creative processes involved in film post-production, rather than bending creative tools to fit the limits of current technology. The result is a uniquely integrated workflow, software toolset, and storage infrastructure that is far greater than the sum of its parts. Factorial has architected, delivered, and maintains more than five Petabytes of critical storage and archive infrastructure that allows all systems at Park Road to access media in-place to allow close collaboration across the facility, without the need to check-out data locally.